You’re a master of beauty. You help people feel and look their best. Beyond helping people feel beautiful, you run a business. This can include dealing with employees, purchasing product, and allowing people into your business or home. All of these things have unique risks that are only associated with your industry. Who needs beauty salon insurance? Most beauty salons carry a Business Owners Insurance Policy. 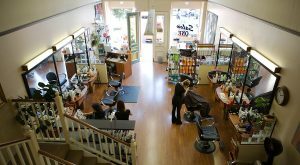 This policy will help protect them from a wide variety of claims and risk associated with running a salon. Business Liability: This coverage helps protect your business from claims and lawsuits alleging injury or property damage that occurred as a result of your business operations such as slip & fall claims or property damage, such as a ruined purse from hair coloring. This coverage can also include libel & slander claims. Business Property: insurance protection for the place where you run your business. This coverage protects your equipment, tools, computers and furniture from damage, theft and more. Business Income: Helps cover the loss of income if your business is unable to operate because of other covered property damages. These examples are illustrative only. In the event of a claim, coverage will be determined based on the facts and circumstances of the filed claim, and the actual policy terms and conditions. While you focus on making people feel beautiful, let Insurance Brokers of Arizona protect your salon business with a great insurance policy tailored to your beauty salon. As an Independent Insurance Agent, Insurance Brokers of Arizona represents over 40 top insurance companies. They can get your salon business an insurance quote and ensure you’re covered. Call Insurance Brokers of Arizona today at: 480-812-1998.